Welcome to Ebi Emporium! Whimsical art decor & lifestyle accessories. As featured by HGTV, Etsy Canada, Global TV Breakfast Show, Apartment Therapy, Grand Designs UK, etc. 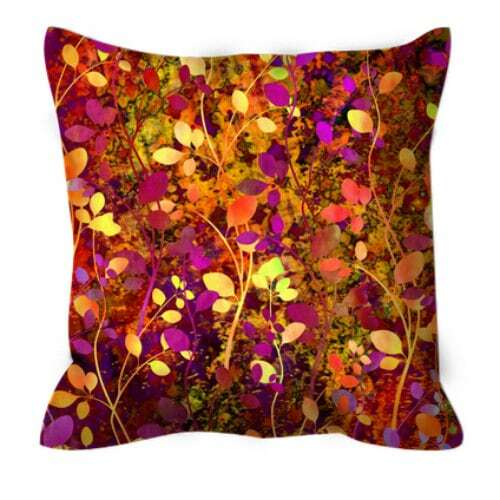 Throw Pillow Cover made from luxurious, super-soft 100% polyester suede fabric, a stylish statement that will liven up any room. Individually cut and sewn by hand, the pillow cover features a double-sided print and is finished with an "invisible" concealed zipper closure for ease of care. It is vibrant, with a UV resistant print. Dry clean, spot clean or wash on cold, gentle cycle. Ethically made in the USA. Available size options and prices for each are detailed in the drop-down menu - Please select the size you need from the options listed there. Please Note: Does not include pillow insert. This image is based on the original painting created by Ebi Emporium. Ebi Emporium holds all copyright and rights of this design. PAYMENT METHODS: I accept Paypal, Direct Checkout (Credit Cards, Debit Cards) and Etsy Gift cards currently. *Payment is required at the time of purchase, and items purchased will only be created and shipped when funds clear. CANCELLATION POLICY: Cancellation requests will be reviewed on a case-by-case basis, and must be requested within 6 hours of placing the order to be considered. Once a home decor or tech device order has been processed with my manufacturer, cancellations are not possible. TAXES: Applicable taxes will be applied to orders placed by Canadian customers. Rates vary by province. I personally wrap all original paintings to ensure your new fine art piece arrives in perfect condition. Each work is wrapped in bubble wrap and is either lined with cardboard or placed into a standard postal bubble wrap package. Often available upon custom request for an extra cost. To purchase insurance or expedited shipping, please let me know BEFORE placing your order. All decor/tech device case products are shipped directly from my manufacturers, & are packaged to ensure safe delivery of the products. Packaging varies based on product type. Please contact me with any questions. Rates vary by product and shipping destination. If your country is not specifically listed, it falls under "Everywhere Else" category and I will refund any cost overage/difference from the actual price to ship to your location. Shipping costs reflect USPS or FedEx shipping rates plus the cost of shipping materials. Shipping time estimates are indicated in each listing. Shipping times differ based on product type and destination. I am not responsible for customs delays. All shipping times are best estimates and may vary slightly. Any costs incurred by borders and customs charged on the shipment of items are the sole responsibility of the Buyer. ORIGINAL ART RETURNS/REFUNDS - IF DAMAGED: If original art is damaged in the process of shipping it to you, please contact me IMMEDIATELY WITHIN 3 DAYS of receipt to arrange a return of the piece and a resolution to the situation. I will either re-create the damaged piece for you as close to the original as possible, or will provide a refund. But, as I package my items carefully, this has never been an issue. PLEASE NOTE - Colors in designs/products may appear different on your monitor, depending on your computer's color settings. Please contact Ebi Emporium PRIOR to purchasing, if you have questions about the colors in a design. Also, it's always a good idea to look at the product on a different computer to compare colors, if possible, and get a clear idea of the colors in the product. ALL HOME DECOR AND TECH CASES ARE MADE-TO-ORDER and are non-returnable/non-refundable. They are not kept in stock, but rather, are custom-made especially for each customer upon order. If you receive a damaged item, please contact me within 3 DAYS of receiving the item, along with a clear photo of the damaged item, and I will work with you to have another exact item created and sent to you as a replacement. The replacement will be the same size/design as originally ordered - Refunds are not given for custom/made-to-order items. You may be required to send the defective/incorrect item back to us, at the discretion of Ebi Emporium's manufacturers. Shipping costs are non-refundable. TRACKING AND CONFIRMATION: I prefer to ship using methods that offer tracking and delivery confirmation whenever possible for local US-based orders. This service is not included for International customers. For US-based customers, tracking information is available upon request. *All original paintings are from a smoke-free home. However, I have 2 cats, whom I lovingly call my "fur babies" and simply adore. Please be aware that any original paintings you receive have been in a cat-inhabited household prior to shipping. *All made-to-order items (home decor and tech device cases) are made in a warehouse and shipped directly from there to my customers.